Thread: What's up with Kyrie Irving and Flat Earth? Question my dear brother Nathan. How important do you believe it is that we ever arrive at an agreement about the natural reality of the shape of the earth God created, and it’s physical relation to the sun, moon and stars and their movement? It's not a salvation issue so it's not important to me. If you want to believe that, then so be it. So long as we believe in Jesus as he claimed to be, then we have no division as far as I'm concerned. My only worry is that for those outside of the faith trying to learn about Jesus that they might stumble if they think that we believe something so outside of mainstream science. Believing that Jesus is real (real, as in, who he says he is) is already a big enough hurdle. If they think we have "wacky" ideas about easily proven things (such as the shape of the earth) they might be inclined to think our beliefs about Christ are just as "wacky." I side with St. Augustine on this. Thank you for your reply, dear brother! Your comments reminded me of some of Light's earlier posts on this thread. I hear you. As for causing anyone to stumble with my questioning and research into the realities of Creation, it's something I am increasingly sensitive to. At the core of my words and actions, there must be true love. Otherwise, all is in vain, regardless of the topic of conversation. I continue to appreciate you and the manner in which you have engaged with me on this thread. It also encouraged me greatly to receive your private message! Bless you for that, dear brother! Think about this for a moment: Suppose you are in a car traveling down the road. How can you tell how fast you are going? The speedometer tells you how fast your wheels are turning, but you could be standing dead still, spinning your wheels trying to get off a patch of ice, so let's remove the speedometer from the car. As you go faster, your car may vibrate more because it's working hard, but these vibrations only tell you the car is working hard, not what velocity you are moving at. So get a good car and some cushions to remove the vibrations you feel. Then get some good earplugs so any misleading sounds won't distract you. And paint your car windows black so that the motion of objects relative to you don't throw you off. Remember that when it comes to the rotation of the Earth, everything around you is moving at the same speed - you, the trees, the houses, your pet dog, everything. Okay, now, how fast are you going? You have no way to tell. You don't feel like you're moving. You feel just as you would if you were standing still! Human beings have no ability to tell absolute motion. So, have we all watched Behind the Curve yet? I have! I'm curious what everyone thinks. Hey dear brothers Light and Smart! Fun analytical and perception question, Light. I’ll think about it! Nathan, yes, I’ve heard of Behind the Curve, but not seen it yet. I even heard Logan Paul did a “reality based movie” on flat earth! Wow, of all the YouTube celebrity personalities. As I’ve long stated, for me this has been and continues to be, an issue of what does God’s word say on the matter, and can (should) the creation account be trusted as authoritative (literal)? I still ponder how much can we glean from the Bible on matters of cosmology that are truly factual evidence as corroborated by our observable senses? I want to believe the Word can be understood, and trusted, in its context, and in reality. “Science” and man will wax on and on in a billion directions with theories, “proofs” and spoofs, but should’nt we stand on God’s word? If so, who’s interpretation should reign surpreme? I contend it’s the Holy Spirit’s interpretation, which I know can be contentious for us, as even the three of us seemingly cannot agree. Lord, help! Alas, we magnify Christ Jesus as Lord of all, and trust God by faith that He knows the full truth, and that is enough. Thus, we continue loving one another, bearing with one another, seeking truth and pressing on. I hope to write more later after I watch that documentary...thanks for the posts! And this is exactly the question I've said you need to figure out before any scientific debate can happen. If you think the bible is saying that the Earth is flat, and you believe that any outside information that conflicts with that must be wrong, it will be impossible to get any further than, "The bible tells me so..."
As I've told you before, the bible is not a scientific textbook. It's not an astronomy textbook. It's a religious text describing an ancient people's experiences with the one they called God (that we also believe in). If we read it as a science textbook, we disrespect the intent that God had when he allowed his people to write down his story. No need to add anything to the scriptures! Just take it for what it is: the glory of God in the experience of his people! Ok dear brother, I’m not the brightest bulb like you Light, but I don’t see how this analogy is applicable to our observable reality on earth. 1. You see, the motion of objects relative to us CAN be seen, so why would we paint the windows black? For example, how come the North Star has remained relatively in the same place in the night sky for as far back as we have recorded history of sea faring people navigating by it? According to what we are taught, the earth is rotating at a different speed (1,000 mph at the equator) than the speed of our orbit (66,000 mph around the sun), let alone the speed our solar system is moving (514,000 mph). So with all that motion going on at once, at vastly different speeds, for thousands of years, how come the North Star has stayed put, right where it is? 2. I’ll tell you why. “And God made the two great lights-the greater light to rule the day and the lesser light to rule the night-and the stars. And God set them in the expanse of the heavens to give light on the earth, to rule over the day and over the night, and to separate the light from the darkness. And God saw that it was good.” - Genesis 1:16-18. You see, the stars are “in” the expanse (firmament), or under the dome, so to speak, along with the sun and the moon. It is they, the Heavely bodies, that are moving overhead, but the North Star stays put, in the center of the night sky. As for the earth, as God’s Word says, “He set the earth on its foundations, so that it should never be moved.” - Psalm 104:5. So, the reason humans can’t feel any motion of earth’s movement, is because it’s not moving. Facts, according to God’s word. Always faithful and true. Finally watched it, brother. As I may have mentioned before, it was a video Mark Sargent did that led me to re-examine what the Bible teaches about cosmology. Granted, to my knowledge, Sargent has never encouraged people to put their faith and trust in Christ Jesus and God’s Word, I still appreciate how God has used him to help people question what we’ve all been taught about cosmology. Thus, I have nothing but compassion for Sargent, Steere and anyone else associated with that film. As long as anyone has life and breathe, I believe they can repent and put their faith in Christ Jesus (I say that in general, not judging anyone in the film). Regarding the content of the film, as it lacked an emphasis on worshipping Christ Jesus, the Creator of this amazing stationary plane we live on, I was not impressed. Also, as I am not waiting for (or needing) more “proof”, the film did nothing to further solidify my convictions, or cause me to doubt what I believe the Bible clearly teaches, and what my senses tell me. However, I have a friend who has been researching this topic, and their watching of the film (on their own, I was not even aware of it) strengthened their doubt about flat earth, citing the failed experiments. I expect that would be a common outcome for already skeptical people. Meanwhile, here is another “documentary” for consideration. This certainly lacks the budget, but I actually appreciate the simplicity and conviction. What did you think of the Behind the Curve film, Smart? Did you watch it too Light? This is actually the most interesting part for me. I don't understand why anyone would believe in flat earth if they weren't a Christian. The only argument I could buy (not an argument as proof of flat earth, but an argument for why someone would believe in it) is that someone reads the bible scriptures on this literally or takes the ancient misunderstanding of space and science as correct. I understand what's at stake for you Caleb, for instance, because you believe that if that part of scripture is incorrect, then the rest of scripture could be wrong (which is, again, I think building your faith on a house of sticks, but that's another topic). I don't understand what's at stake for people like Sargent. One thing they all have in common though (including you) is that they all believe unprovable (and unproven) conspiracy theories. So, that is probably the biggest link for everyone involved in flat earth. In fact, is there anyone that even believes in flat earth but not in general conspiracy theories? I think this says a lot about how you view science. True science is never done. There isn't a good scientist on the planet that would ever say "I am not waiting for (or needing) more 'proof...'" If new information comes out that says that water actually isn't wet, then scientists will change their understanding and rework everything they thought they knew to account for this new information. What you're effectively saying is, "I want to have this conversation about flat earth, but I'm not interested in any information you have, I only want to tell you about what I have, thanks." That's why, like I keep saying, it's fruitless to talk about this with you. No offense (and I know you don't take it). Now, this is a person I'd like to talk to! Not because they might agree with me, but because they examined information that conflicted with their own and made the necessary adjustments. I mean, you cited Sargent as the guy who brought you into this (which is maybe ironic since the fact that an imperfect, possibly non-Christian man, and not scripture, is what got you re-thinking it - since you hold scripture as infallible in that regard) but the first thought that made him wonder about flat earth (the planes not flying over the southern hemisphere I think) was immediately debunked in this movie (and I'm sure in a lot of places online before)! The failed experiments you cited as well were pretty damning! There's an observation made by someone in the movie saying these guys might be good scientists if they actually followed the results of their own experiments (I'm paraphrasing). The gyroscope thing was a great scientific experiment! Of course, it proved the earth is round (because it is) but instead of calling it all off, they got even more money to keep going (and failing, over and over again, because again, you can't prove something that isn't true). Last edited by Nathan Smart; 04-15-2019 at 07:22 AM. I think this says a lot about how you view science. True science is never done. Well, let's be careful there my dear brother. I remain extremely fascinated, engaged, open and even active in true science. That said, I confess that my openness is mostly geared toward what I consider "true science", which is defined by observable, repeatable evidence. So far, and I admit only being a few years into this journey, I have not seen any scientific (observable, repeatable) evidence to suggest that water can stick to any spinning ball. In my scientific observations, water always seeks it's level, based on the boundaries that it is contained in. What "science" are you believing in that has provided observable and repeatable evidence that water sticks to spinning balls? I don't buy that it's scientific proof to say "the pictures of the globe that we live on is proof enough", because if you can't repeat and observe the phenomenon itself (a massive spinning ball that has water sticking to it), then how can it be scientific? 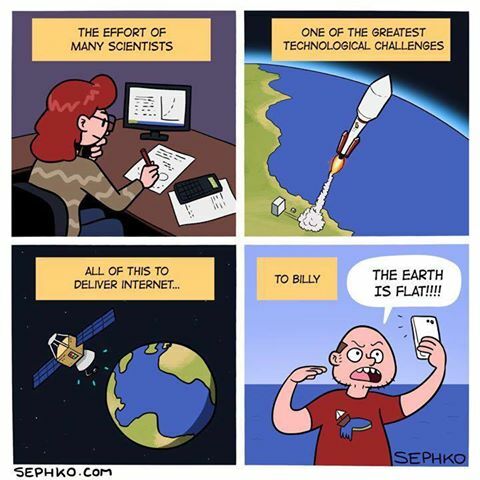 Short of being able to repeat and observe it, I believe we would have to simply call the globe a "theory". Whereas all over the earth, which the Bible says is under the firmament (meaning we live in an enclosed system), we always observe water seeking it's level, based on the boundaries that contain it. That's repeatable and observable, so it's easier for me to move that into the category of "Creation reality", and away from "plane earth theory". No offense (and I know you don't take it). You are correct, brother Nathan! I appreciate and love you from afar, brother! I have to apologize if the way I worded things gave that impression, and I can see how it could have. I truly believe God brought me into this topic, and after watching that first Mark Sargent video, I prayerfully sought the Lord through His Word, and it was confirmed in my spirit that I should re-examine my beliefs in light of it. The failed experiments you cited as well were pretty damning! I know, right. Great choices of experiments to show in that documentary. Not! (lol) In my opinion, that documentary was NOT intended to encourage anyone to become a believer in Biblical cosmology. So, I'm not surprised at the "fails" that were shown. From the little research I've done, there are countless people doing experiments (both Christians and non) and coming up with compelling results that are at the very least, prompting more questions. 1.What is your definition of "level?" 2. What moves that water? 3. Why does the water move at all? In other words, why does it always fall towards the earth? Why doesn't it just float? So you are discounting those failed experiments? What was wrong about the gyroscope, for instance? I don't want to see experiments that prompt more questions. I want to see experiments that offer proof of a flat earth. Do you have any of those? Did you watch it too Light? Last edited by The Light Within; 04-18-2019 at 02:13 PM. The spin of a thousand miles per hour is SLOW! It is achingly SLOW! Especially for a massive squashed beach ball that has a middle with the circumference of 25 thousand miles! Let me give you a perspective of how achingly slow a thousand miles per hour is. Go out at 12 noon on a clear day, pick a tree, a single tree and sit down and watch the tree’s shadow move across the ground for ONE HOUR. Just sit there and stare at that shadow. Note it’s position at 12 noon, and then note it’s position at 1 pm. During that time, the Earth had turned one thousand miles. That’s what one thousand miles per hour looks like for something as massive as the Earth. The tree’s shadow moved barely a foot. One hour passed, the tree’s shadow moved not even a foot, a half a foot? A couple of inches? That is one thousand miles per hour, folks. That’s what that looks like. And it’s SLOW! The Earth’s spin is not fast enough to sling water from its surface. The Earth’s mass plays a part in holding the water and the atmosphere in place. Because it creates a large enough pull towards its center of mass to hold the water to its surface. It’s why we don’t go flying off. Objects are pulled towards the center of mass, well, that center of mass is our planet’s core. So, we’re able to stand on the surface of the planet, and the water is able to blanket the surface of the planet. The Earth isn’t like the tennis ball. The tennis ball is tiny. So when it spins, centrifugal force is greater than the pull of the ball’s center of mass. So the water is going to sling out. But that ain’t so for the Earth. Because the Earth’s center of mass is greater than the centrifugal force of its spin. One thousand miles per hour is SLOW! And it’s not enough to sling its water free from the surface. Now if the Earth were to spin so fast that a day lasts only a second, then it’ll have the centrifugal force it needs to sling all its water from its surface just like the tennis ball. But unfortunately, such a speed would turn it into an accretion disk and…well it might destroy the solar system itself. I’m fine with the thousand miles per hour, thing. It’s nice and comfortable.